Gay Paso Chico is a male only gay hotel in Playa del Ingles and the ideal place to stay with a group of friends or for solo travellers who want to party and be based near Yumbo Centre. It's also walking distance to the sand dunes and the famous gay beach at Kiosk #7. Gay Paso Chico has 6 newly refurbished bungalows. They are spacious, clean and with full kitchen facilities so you can cook your own meals if you don't want to head out. The other highlight is the pool area. We loved hanging out here with friends drinking home made cocktails before heading over to the gay bars in Yumbo across the street. Rooms start from €75/$84 and minimum stay is for 5 nights. The 5* Seaside Palm Beach Hotel is a gay friendly resort in Maspalomas. It is a luxurious getaway for those who don't necessarily want to be based right at the heart of the Yumbo gay scene in Playa del Ingles. It's in any case only a short taxi ride away to the gay bars. The hotel grounds have several pools including an enclosed adult only lagoon pool, surrounded by a lavish palm garden, outdoor gym and one of the best hotel spas we've experienced with a range of saunas, steam rooms and plunge pools to relax in. Rooms start from €210/$240 a night and includes breakfast. 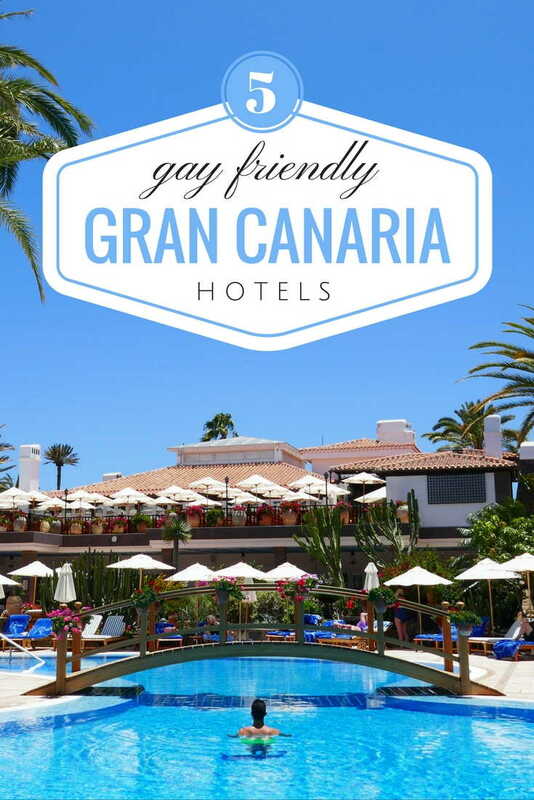 The Grand Hotel Residencia is a luxurious gay friendly resort in Maspalomas, famous for its Michelin recommended restaurant. 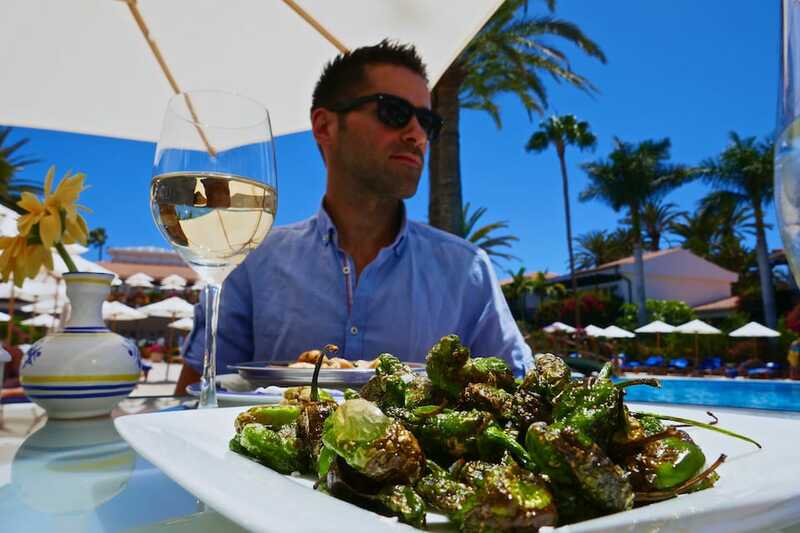 Our greedy Frenchman got particularly excited by culinary prizes such as Marinated Atlantic turbot served as ceviche and yummy pimientos de padrón (Canarian green peppers). The Grand Hotel Residencia has a very pretty pool area which will make you never want to leave. The pool boys are very attentive and serve up delicious Mojitos whilst you soak up the sun rays. Hotel Roca Negra is near a fishing village called Puerto de las Nieves in the Northwest of the island. It's popular with gay couples who are looking for a romantic stay, explore the island, meet and interact with locals – a far cry from the mass tourism in Playa del Ingles. Roca Negra is located up in the mountains with not only sea view, but some incredible sunsets too. It's quite remote so you may want to consider renting a car to explore more of the surrounding area around the Agaete valley, including the Agaete botanical garden. Prices start from €110/$120 a night and includes breakfast. 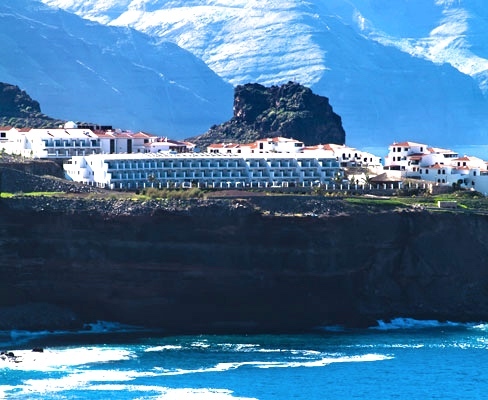 Hotel Parador De Cruz De Tejeda is a hidden gem, 1,500 metres up in the mountains and 10 minutes drive from the small town of Tejeda in the centre of the island. The hotel rises above the clouds so you wake up to some incredible mountain views, making you feel like you're on top of the world. This is a complete contrast to the party scene around Playa del Ingles. Here it's all about peace and serenity, as well as an infinity pool to die for! WiFi is limited, but that's part of the charm: you come here for a complete escape and to feel at one with nature. We love the trekking Gran Canaria offers and Hotel Parador is the ideal base to explore some of the best trails on the island, particularly for Roque Nublo. Prices start from €100/$115 a night without breakfast and €145/$162 a night with breakfast. To read more about alternative experiences on the island, check out our 5 interesting facts about Gran Canaria and to learn more about the gay scene check out our gay guide to Gran Canaria. Also, read why we think Spain is one of the most gay friendly countries in the world.